Lumia Cyan is firmware, the underlying foundation upon which Windows Phone the Operating System resides. It is what provides the APIs and other driver updates that are required for Windows Phone to run on the device. It represents the 3rd firmware update from Nokia after Lumia Amber and Lumia Black. 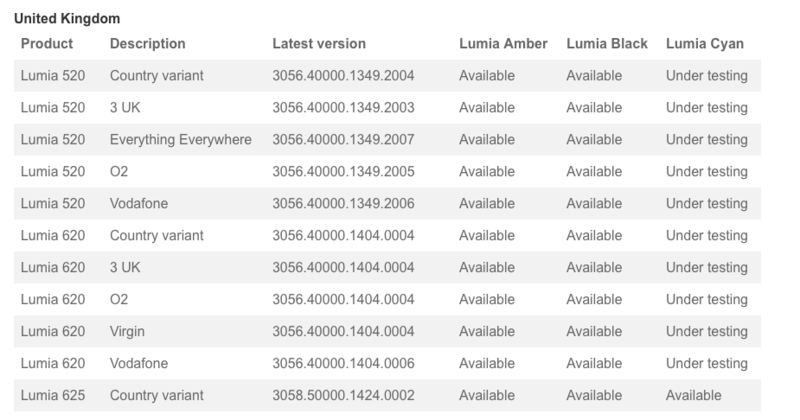 a lot of mixed messages around this update with some referring to it as the Lumia Cyan update. Be clear: Lumia Cyan and Windows Phone 8.1 are two distinct things but you must have Cyan on your Nokia Lumia Windows Phone in order to run Windows Phone 8.1. Now, the biggest question remaining then is when will you get Lumia Cyan and Windows Phone 8.1 on your Nokia Lumia Windows Phone? The answer to this question will depend on where you are located in the world and your mobile provider. Nokia has provided a comprehensive matrix of when you can expect the update depending on these factors. You can find that matrix on this page. Nokia & Microsoft have both stated that all devices that can run Windows Phone 8 will get the 8.1 update. It is a matter of when carriers get it rolled out.